Cams located on the camshaft that open and close the intake and exhaust valves in time with the motion of the piston. 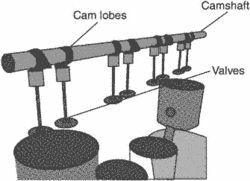 Cam lobes control the valve lift, and there is a direct relationship between the shape of the cam lobes and the way the engine performs in different speed ranges. They split the string with a yoke, spread it out and feed it onto the two wide-stance cam lobes of the parallel system. Tenders are invited for milling of cam profile and grooves adjacent to cam lobes, on labor charge basis only. Cams are especially vulnerable because the contact surfaces between the cam lobes and the tappets are under as much as 100,000 PSI of pressure. Variable valve timing utilizes dual cam lobes for low and high rpm operation. With the MultiAir system a dual-action solenoid that controls the position of the valves; it is particularly beneficial for combustion at low speeds because there is infinite control of the valves such that there is a precise amount of intake air, not the fixed opening characteristic of the valves being opened by the cam lobes. This advanced system utilizes mild cam lobes to operate the intake valves at low rpm for a great holeshot, mid-range power and economy. As one overhauler explains: "The owner flies his plane in to the shop, and a few days later he absolutely doesn't believe you when you call up and tell him his cam lobes are worn flat and there's metal in the engine. What's unique here is that we can grind the journal bearings and cam lobes in a single fixturing, a single chucking. Instead of skipping between high- and low-lift cam lobes, VCM selects a rocker-arm alignment that delivers no valve lift. Mahle Bentiltrieb Gmbh is building a plant in Leibertingten, Germany to make composite camshafts with P/M cam lobes. 5-liter V6 is part of the VQ engine series, which has been recognized as one of the "Ten Best Engines" by Ward's Auto World magazine for 10 consecutive years and features continuously variable valve timing, modular engine design, microfinished crank journals and cam lobes, molybdenum coated lightweight pistons and electronically controlled throttles. Tenders are invited for Speciality Lubricant For Cam Gear, Cam Nut And Cam Lobes For Also And Emd Locos.